The International Wedding Photographer of the Year (IWPotY) competition has announced it’s 2017 winners, and there is plenty of wedding photography inspiration to go around. Entries were submitted into one of nine categories, and submitted photos had to be taken on the day of the wedding to quality. 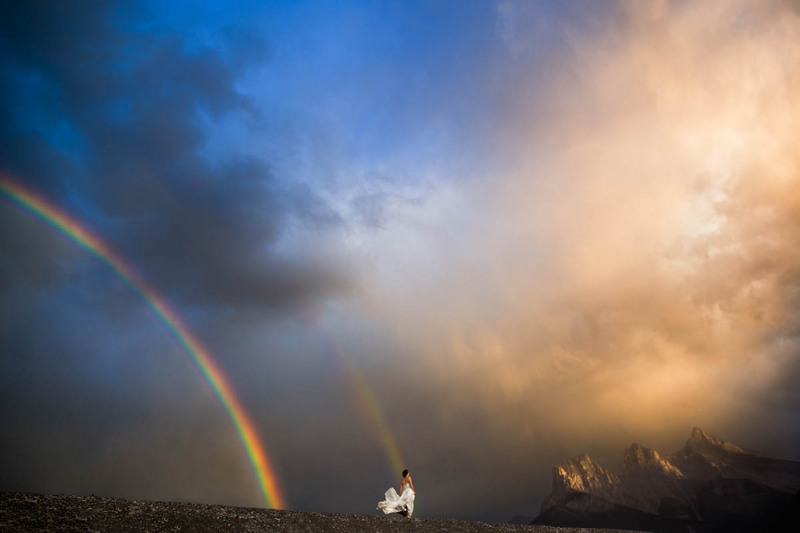 This year’s Wedding Photographer of the Year grand prize went to Two Mann Studios‘ Erika Mann for her portrait of a bride with a double rainbow in the background. The image was taken near Cougar Creek in Canmore, Alberta, Canada, according to the photographer, who explained that an “unpredictable storm” had provided them with the spectacular backdrop. Paige and Daniel had a super low key wedding, with the reception taking place in their parent’s backyard, with about 25 guests. Thankfully their parents have one of the most beautiful backyards in the planet, along the banks of Cougar Creek in Canmore, Alberta. After a short, and unpredictable storm, we were treated to the most amazing double rainbow. Lanny and I got low into the creek bed so we could remove the houses, and simplify the frame to the rainbow, mountain and Paige, with her dress billowing in the wind. As the grand prize winner, Mann will receive $3,000 USD, as well as a Nikon D850 and other items totaling $9,125 in value. The contest’s Runner Up is Paul Woo of Wandering Woo, who claimed the spot with a touching image of a bride’s son becoming emotional during the wedding ceremony. The Runner Up prize includes $1,000 USD, a Think Tank Signature 13, Photo Mechanic user license, and Hold Fast Skinny Money Maker camera strap. Top scoring images have also been selected across various categories, including Black & White, Bridal Party, Couple Portrait, Dance Floor, Epic Location, and more. Scroll through the gallery at the top to see all of the category winners, and if you’d like to see the top 10 from all of the categories, you can find the full albums here.